THERE was a kingdom in the moon. The king had a son. His name was Sumantapura. He was a handsome, kind, diligent, and very powerful prince. The prince enjoyed travelling from one planet to another planet. One day he visited planet earth. He was so amazed with its beauty. He wanted to stay on earth. So he went to an old woman's house. He carefully went inside the chicken cage. Later he changed himself as an egg. In the morning, the old woman found a strange egg in the chicken cage. It was so big and beautiful. She carefully brought the egg inside her house and put it on a basket. Later the old woman went to a market. When she went home, she found all her food was gone. "Who ate my food?" she thought. The incident kept on repeating on the following days. The old woman wanted to catch the person who ate her food. She prepared some food and some betel leaves. When someone ate betel leaves too much, the person would be unconscious. After the old woman left, Sumantapura changed himself as a man. He was so hungry. He saw some food and some strange leaves. He did not care. He was so hungry that he ate all the food including the 'strange leaves'. A moment later, he felt terrible headache. He was unconscious! The old woman was so surprised to see a handsome young man lying on the floor. She tried to wake him up. Finally she did it. The prince was conscious and he also apologized to the old woman for eating her food without her permission. The prince also told her who he was. He also asked her permission to stay in her house. The old woman was so happy to have a young man in her house. She then adopted him as her grandson. She called him La Onto-ontolu, which means an egg. The prince repaid the old woman's kindness by building her a very big house. La Onto-ontolu heard that King Buton had six beautiful daughters. He asked his grandmother to propose one of the princesses to he his wife. The old woman really loved him, so she went to the palace to meet the king. The king let the old woman to talk to his daughters. The old woman talked to the oldest daughter. She completely rejected the proposal. Why? It was because she hated the man's name, La Onto-ontolu. She thought the man would be ugly and looked like an egg. The old woman did not give up. She went to the second princess. Again, the princess rejected the proposal. She also felt the same as her older sister. The old woman continued to meet the third, fourth, and fifth princess. Unfortunately they all rejected her proposal. The old woman did not give up. She still had one last hope. It was the youngest princess. The old woman talked to the youngest princess and also told her that his grandson was kind and helpful. Surprisingly the youngest princess accepted the proposal. All her sisters mocked her. They said that she would marry a man who looked like an egg. The king set a wedding party. The old woman came with La Onto-ontolu. People were so amazed to see how handsome he was. The youngest princess' sisters were so jealous! They had a bad plan. They wanted to kill La Onto-ontolu by drowning him in the sea. So after the party was over, the sisters asked the youngest princess and her husband to go fishing in the sea. When they arrived, the sisters dropped the youngest princess ring to the sea. The princess was sad, La Onto-ontolu immediately jumped and dove to find the ring. Seeing that, the sisters directly rowed and left him! The youngest sister was crying! She completely had no idea why her sisters were so mean to him. She talked to the king, however afher sisters said that La Onto-ontolu had an accident and it was not their mistake. 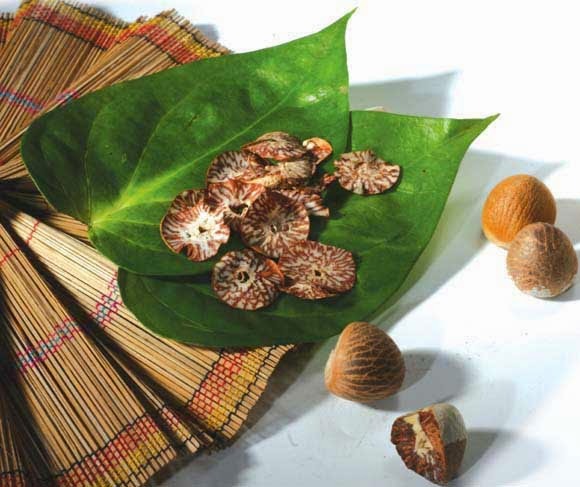 The betel (Piper betle) is the leaf of a vine belonging to the Piperaceae family, which includes pepper and kava. It is valued both as a mild stimulant and for its medicinal properties. Betel leaf is mostly consumed in Asia, and elsewhere in the world by some Asian emigrants, as betel quid or in paan, with or without tobacco, in an addictive psycho-stimulating and euphoria-inducing formulation with adverse health effects. Betel is notable for staining the teeth of regular users.